NOT only is Israel Folau happy to cover up his tattoos in Japan, he wishes he never got them in the first place. As they prepare for Saturday's third Bledisloe Cup Test in Yokohama, the Wallabies are coming to grips with the unique cultural sensitivities of next year's Rugby World Cup host nation. One of those sensitivities is the necessity to cover up tattoos - which many of the Wallabies have - while in public. World Rugby recently issued a warning that teams and fans should avoid displaying their tattoos, in part because overt body art has an association with the Yakuza, the Japanese mafia. While the Wallabies were surprised at having to cover up at gyms and swimming pools when they toured last year, those issues have hardly registered on this visit. Although, that doesn't mean the Wallabies are covering their tattoos completely. Since arriving in Tokyo, the tattooed members of the Wallabies have worn shirts rather than singlets when in public. 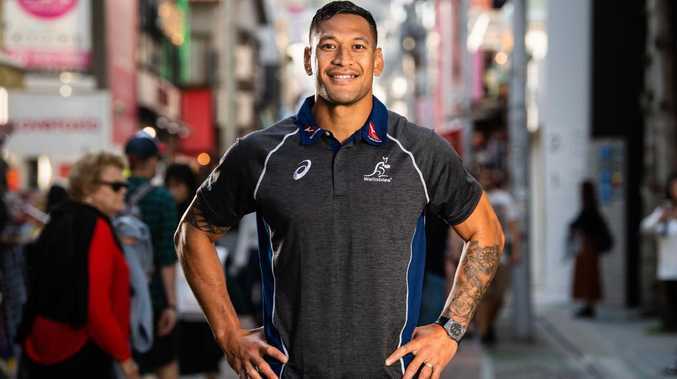 Folau, who has a number of tattoos on his body and arms, wore a shirt that covered half his bicep and, therefore, revealed his ink at a public signing appearance at an ASICS store in Tokyo on Wednesday. But the dual international said he hadn't experienced any negative feedback during the tour. "No, but I respect the culture and the people here," Folau said. "I'm happy to cover up the tattoos in respect of the people here and the culture. "I love the Japanese culture and the people here, they're amazing and always embracing, and not wanting to hinder that and I'm happy to do everything I can and if that's covering tattoos, I'm happy to do that." Interestingly, though, Folau revealed he wished he had never got any tattoos in the first place because they went against Biblical teachings. "To be honest, if I have my time again, I probably wouldn't have got any tattoos and that comes back to, again, my faith," he said. "That's something I came across afterwards. "But, like I said, I can't change the past." Folau said he wouldn't get his tattoos removed. "No, probably not," he said. "I think the change, in terms of faith, for me is from the inside out and anything I've done in the past, I know that it's all gone now. "If I had my time over I probably wouldn't have got any tattoos. "In saying that, I'm just grateful for where I'm at now and where I've come from." Meanwhile, Samu Kerevi, who also has a number of tattoos, said his brief encounters with the Japanese community had been positive and they had been more interested in the size of the Wallabies. "Going downstairs to lunch, I always wear a long sleeve (shirt) anyway, just to cover it up," Kerevi said, after being asked by a local reporter whether he had received any funny looks. "But I think the people here are more in awe of our body shape more than anything. "You've got the big boys walking in, so they're all looking up at the boys. "So it's more us and our bodies than looking at tattoos." Pressed as to whether there had been any issues when using the swimming facilities, Kerevi lightheartedly deflected the question. "I think the boys have gone to the sauna. "The only issue is giving them a little towel and nothing else."